Ears are large and continue the wedge. Eyes are blue and almond shaped. In fact, the Balinese is exactly like a Siamese except for the coat, which is medium in length, fine and silky without a downy undercoat. It lies close to the body, flowing toward the rear where it ends in a graceful, plumed tail. It is believed that "fuzzy" kittens were born to Siamese litters from time to time. This longer coat being undesirable, the breeders would quietly pet these kittens out. All of this changed forever in the 1950s when two Siamese breeders, Mrs. Marion Dorsey of Rai-Mar Cattery in California and Mrs. Helen Smith of MerryMews Cattery in New York, both found longhairs in their Siamese litters and were quite taken by their beauty. 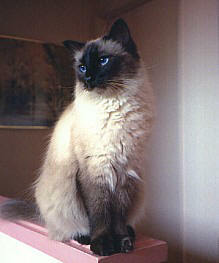 Rather than putting them out as others had done, they began line breeding to produce longhair Siamese. It was Helen Smith who came to name these cats Balinese because she felt that the name Long Hair Siamese did not flow well and that they greatly resembled the grace and elegance of the Balinese dancers. If you share your life with a Balinese you will never be at a loss for a best friend. Balinese adore their people and have to be involved with everything their person does. They make you feel that no matter what you are doing, you are the most wonderful, fascinating creature on earth. They are very verbal and can speak to you on just about any subject. If you are sad, they will weep with you; sick, they will comfort you; and happy they will play with you. And do they love to play! Balinese love to ride around on your shoulder and to play "fetch the mouse." Give them a ping pong ball and they have a great game of "football," especially on a hardwood or tile floor. The males are especially affectionate. Balinese are very easy to care for. Because theirs is a single coat that lies close to the body, all that is needed is an occasional brush or comb. A good diet and plenty of exercise are essential to maintain the Bali's firm, tubular body and silky coat (Bali's should not be fat or flabby). The ideal Balinese body feels like steel sheathed in silk. If you are seeking a highly intelligent, interactive, verbal pal, you would be delighted with a Balinese. Balinese are easy-going cats adjusting to even large numbers and a wide variety of other animals (birds, dogs, reptiles etc.). This is probably because of their high intelligence. Long-time owners often say that a Balinese kitten brought into a group of established cats are typically accepted immediately. Some say it is because cats in general organize themselves in order of intelligence and find Traditional Balinese kittens fascinating in this regard. This may also be the reason a Balinese will as an adult, usually be at the top of the "pecking order." Balinese are also very fond of dogs, perhaps (like Traditional Siamese) feeling akin to them, and often will sleep curled up with "their" dog and even let themselves be nuzzled or groomed. Balinese are very playful and intelligent cats and for this reason adapt easily to the noise and activity of children, typically throwing themselves right into the middle of the fun. Balinese however will not tolerate being mistreated. Young children should be carefully supervised with kittens, particularly those kittens so young they can't escape the child's attention. Balinese are cuddly and affectionate and their soft hair makes them ideal as something soft and warm to hold and pet. At the same time their fine constitution and disposition makes them able to play for long periods without tiring, making them an ideal companion for children who handle them properly. Balinese should never be allowed outdoors except in circumstances where they are prevented from wandering, such as in a high-walled covered patio.